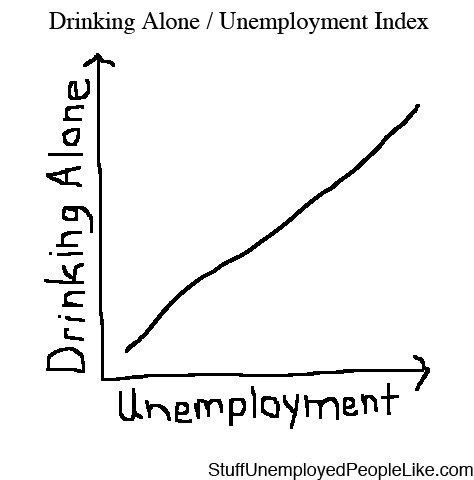 There is definitely a correlation between an increase in drinking alone and an increase in unemployment but don’t jump to conclusions and automatically cite AA’s Twelve Step program if you suspect your unemployed friend has a drinking problem. Chances are greater that your jobless bum of a friend is just enjoying the freedom that comes with unemployment, and that freedom entails drinking whenever the fancy strikes. When employed, most people enjoy having a drink, whether it’s a sneaky drink at lunch or at happy hour with co-workers. That loving relationship with alcohol doesn’t end just because a job does. What happens is the unemployed give booze the chance it deserves to be a special friend that helps kill time and pain all in one go. It’s unrealistic to think that just because unemployment took away one’s social life that it should take away one’s ability to drink too. If flipping through the channels and coming across some sports game, what would be the right thing to do: crack open a cold beer and enjoy the game, or sit there sober just because society has hammered into our minds that it’s not okay to drink alone, and if the lonely drinker protests it’s not a problem, that it’s a sign of alcoholism? Foolish mortals! Don’t judge just because you’re jealous of the unemployed’s ability to not worry about waking up hungover the next morning because they can sleep until the pain goes away. Furthermore, don’t cry “alcoholic” just because you’re trapped in the office when your friend texts you about deciding to stop their stroll on the beach to enjoy the view with a mid-day drink. The employed can concentrate on working while the unemployed will work on sucking their bottles dry until their livers hurt. You would do the exact same thing on the weekend. Well, guess what? Every day is a weekend for the unemployed. It’s their party and they’ll drink if they want to. I can have a few beers at least and not worry about it. I think the drinking alone as a sign of alcoholism refers to someone who drinks morning, noon and night, and cannot function without alcohol. I’m fine being sober until the sun goes down, but then why not have a few if I’ve got free time?